For the first time since being tracked, digital media -- including online, social and mobile -- has approached parity with television as the most important medium among agency executives, according to the latest quarterly survey from Strata, the media data processing provider that services roughly half of all U.S. ad agencies. Asked what their No. 1 medium of choice was during the third quarter of 2011, 34% of agency executives cited digital, only one point lower than the 35% who cited local TV. That's the closest point of parity in the three years since Strata began querying its agency clients on the dominance of various media in their workflow and budgeting, and represents a 43% leap from the second quarter of 2011. The findings, which are based on a segment of more than 900 agencies that process about $50 billion worth of media through Strata’s systems, also reflect the rapid decline in the importance of television over the past three years, along with other traditional media, as agencies and clients refocus their energies on digital media matters and workflow. In fact, the survey indicates that digital may be at the tipping point of overtaking all other media in terms of importance, especially if the economy becomes any more unstable. While the third-quarter survey indicated that advertising budgets remain relatively stable and continue to grow overall, the agency respondents said print (52%) and local TV (24%) are the media most likely to take a hit by ad spending cuts. While the executives said their advertising plans currently remain stable, most said they don’t expect the marketplace to gain strength until after 2012, and that TV-centric categories such as automotive and entertainment are the categories asking to cut ad spending the most, according to 30% and 21% of respondents, respectively. That is clearly reflected in Strata’s tracking data, which show a steady growth in the Internet, while spot TV has steadily decreased over the past 12 quarters, according to Shelton. “There hasn’t been a huge disparity between digital and TV since Strata started the survey in 2008, but the margin has steadily decreased quarter over quarter, he said, noting that “in 2008, 60% of respondents indicated that TV was a top focus, with digital at 12%." The data indicate that social and mobile are boosting the overall role of digital in agency and client organizations. Nearly nine out of 10 (89%) of respondents indicated that they would use Facebook in their campaigns during the third quarter, up 10% from the second quarter. And for the first time, YouTube (39%) was the No. 2 most desirable social medium for campaigns, surpassing Twitter (37%). Google+ is still on the outside looking in, with only 14% planning to use it during the third quarter, down 47% from the second quarter. LinkedIn was a strong No. 4 in social media choices at 22%. The iPhone and Apple’s iAds platform continued to be the market leader in mobile advertising perceptions, with 78% of respondents noting it is the device their clients are most interested in advertising on, although that is down 10% from the second quarter. Google’s Android platform, however, is closing the gap at 54%, up 7% from a year earlier. The iPad remains a strong platform among tablets at 46%, up 85% from last year. “With Amazon and Apple continuing to focus on content for tablets, 69% say that focus will make this medium more attractive to advertisers,” the Strata report noted. 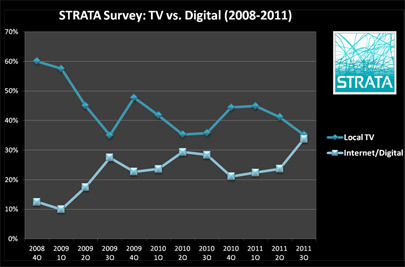 Despite these trends, the Strata respondents were mixed on the long-term dominance of digital vs. “traditional” media. While one-fifth said they anticipate spending more on digital than traditional media within “one to three years,” more than a third (36%) said digital will never dominate their advertising budgets. Those perceptions of ad agency executives no doubt are colored by the sentiment of their clients. Only 56% of the agency execs said they believe their clients “understand the value” in digital, while 44% said they don’t see the value.